It is hardly possible to imagine a director preparing himself more thoroughly for his job, albeit one of the most challenging jobs of the trade, or to imagine an actor who not only has an amazingly large number of precisely defined characters at his disposal but is also capable of breathing life into them simply by his voice: the multi-talented Sven-Eric Bechtolf is currently busy working on his production of Richard Wagner's "Ring of the Nibelungs" at the Vienna State Opera; but also when on his own in front of a microphone he gets to the bottom of that titanic poetic work, with acting verve, accuracy, and the necessary sense of humor. Wagner's text, often barely intelligible in operatic performances, is finally called to the fore: ancient myths merge with modern psychology to gain timeless topicality. 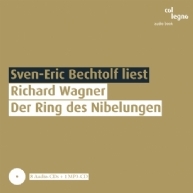 Outwardly it may all appear to be about gods and heroes: yet in this brilliantly mastered tour de force Bechtolf proves that the "Ring of the Nibelungs" is essentially a first-rate human interest drama. Born in Darmstadt, Germany, in 1957; actor and director. Numerous productions at renowned theaters in Germany, Switzerland and Austria, e.g. Zürcher Schauspielhaus, Schauspielhaus Bochum and Thalia-Theater in Hamburg. Between 1999 and 2006 he was a member of the ensemble of the Viennese Burgtheater and also performed in various productions at the Salzburg Festival. He has received a number of awards, e.g. the "Nestroy" as best actor in 2001 and 2002. From 2007 to 2009 Bechtolf directs the new production of Richard Wagner's Ring of the Nibelungs at the Vienna State Opera. His literary reflections on Wagner's Rheingold entitled "Vorabend. Eine Aneignung" have been published by Haymon Verlag. The 2nd audio book from the artist released with col legno, read by Wolfram Berger and with music from our treasure chamber – audio entertainment beyond compare. Günter Brus’ marvellous novel read in German by Bernd Jeschek! „Since you are getting all chummy with me, I’ll have my voice put on its ice-skates in a jiffy and skate right into you.” - Todesraten, a radio drama with a tremendous pull.